The 3rd Century saint - on whom Santa Claus was modelled - was buried in the modern-day town of Demre in Turkey. The Turkish government said it was considering making a request to Rome for the return of the saint's remains. While Christmas is by and large not celebrated in Muslim Turkey, the Christmas figure of Santa Claus certainly is, in the Mediterranean town of his birth. He was born in what was then the Greek city of Myra in the third century, and went on to become the local bishop, with a reputation for performing miracles and secretly giving gold to the needy - on one occasion being forced to climb down a chimney to leave his donation. 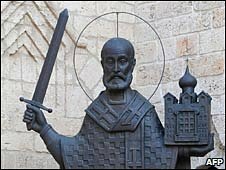 After his death he was canonised as Saint Nicholas, and venerated in much of the Christian world. But when Myra was occupied by Arab forces in the 11th Century, Italian sailors came and took the saint's bones to the port of Bari, where they remain interred to this day. Prof Nevzat Cevik, head of archaeological research in Demre, says Saint Nicholas had made it clear during his life that he wanted to be buried in his home town. Even without the bones, the town of Demre has not been shy about cashing in on its most famous native son - today visitors to the Byzantine church there are greeted by a large, plastic Santa statue, complete with beard and red snow-suit.